Hello! My knitting the past week has been awesome. I'm on the second sleeve of my fair isle sweater. I'm quite confident that the cuff will be knit and bound off tonight. After work tomorrow I will soak and block the sweater. Can you imagine how excited I am to wear this while it's still winter time? 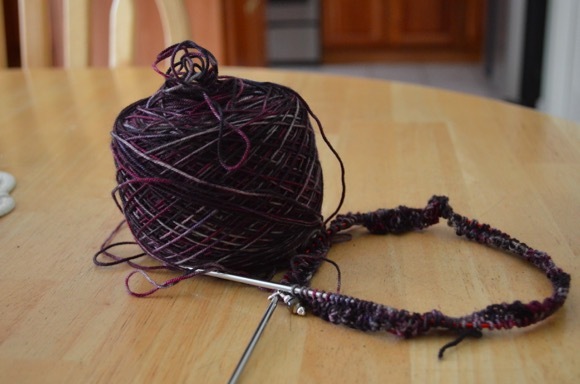 Last week I didn't have a portable project on the needles to grab and go when I was babysitting. This week I have two projects. Over the weekend I cast on another cowl, Heart Warmer. When I saw this cowl, I was excited to see the same shape as the three color cashmere cowl only in one color. I will probably not change needle sizes as called for in the pattern and instead I'll block the daylights out of the cowl. Also I'm not a fan of bobbles so I'll either do a purl stitch or a yarn over (I haven't decided yet). I started this wurm hat before the fair isle sweater, but then the sweater took over my brain and I put the wurm hat aside. I robbed the four inch needle tips from the hat for the sweater sleeves as well (this is why I had nothing for babysitting last Wednesday!). I have two wurm hats and wear my green one all the time. I wanted a simple gray hat (I'm in a gray mood, ha) to go with my black coat and the myriad of cowls and shawls I wear. This will work! Thank you for your comments, I read each and every one. I try to visit if you have a blog. Welcome to all the new people who are visiting, please check out all the other commenters spaces if you get a chance. This community is a wonderful uplifting group of people and I am grateful. Awesome! That is such a beautiful sweater! Wear it with pride. Lots of knitting here with our crazy snowy days; it was supposed to melt today, but instead it's snowing hard. I need to check out that Heartwarmer, and thanks for the Wurm reminder. (That pattern is here somewhere.) I've been working on UFOs and some socks. You are a NASCAR racecar zooming through that jumper WIP. Wow! I like the looks of your next cowl. I don't believe I've knitted any of her patterns yet. I would maybe try it in a heavier weight yarn. I can't wait to see a modeled shot of your sweater! I personally think the groundhog was wrong, so you'll have plenty of chilly weather left to wear your beautiful FO! I'm still working on my Sockhead Cowls, and also hoping for cold weather to continue so I can wear them. Your sweater is fantastic. Looking forward to a modeled photo. Glad you have some traveling projects again. Your sweater is awesome ! Congratulations ! It's perfect for jeans or slacks. I love the Wurm hat. Hopefully I'll get to make one soon. The cowl is nice but I agree about the bobbles. I like bubbles but not so much in a cowl. I also agree that using one needle should suffice. So far I have no plans for the weekend other than rearranging a few things and knitting. That sweater is going to be spectacular! And, that cowl!! Hmmm! I am feeling an urge to put that in my queue! It might be the perfect gift knit! That sweater is absolutely beautiful. You are going to look fabulous in it. I am so glad you have a couple of portable projects. 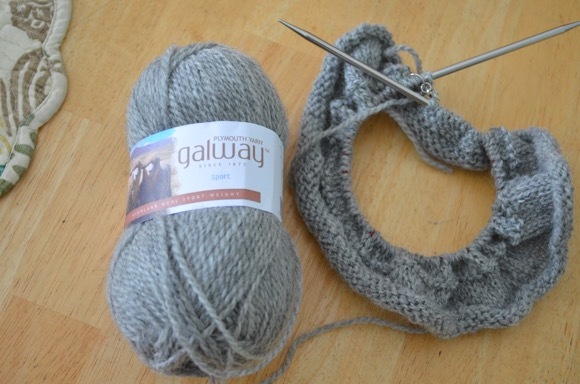 I was thinking of Galway yarn the other day. Once I knit a long scarf out of it and can't find the scarf. It was so warm. I can't wait to see you in that sweater. It is SO pretty! What a beautiful sweater! Can’t wait to see a picture of you in it. 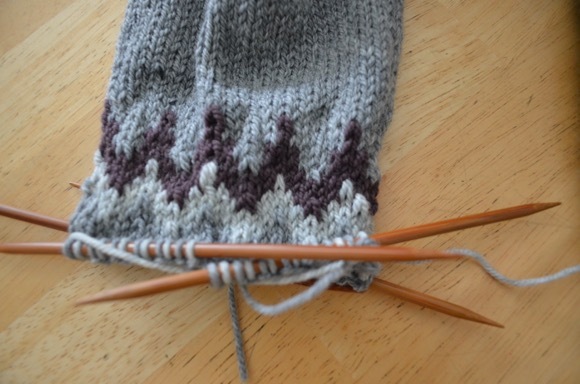 I’m working on my toe up socks. I may need to start over. It seems very big. Actually, I may cast on the second sock and try the smaller size. im loving your sweater!! it is absolutely gorgeous. 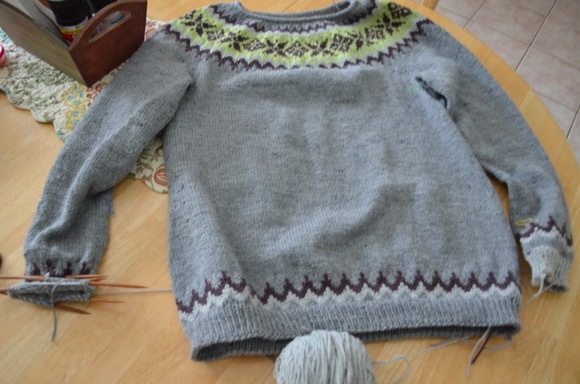 Karen you have done an amazing job on that sweater I am so excited to see it finished. I do hope you share a photo of you wearing it. I needed a new portable project for hospital appointments and have started on another scarf. I've wanted to make a Wurm hat for a while now, but it's gotten pushed to the back burner for a while. Maybe now's the time... Your sweater is turning out beautifully! I did my first real colorwork project last month, and it was addicting! I'm almost ready for a sweater :) You're inspiring me to really go for it! I have such a severe case of sweater envy! Your sweater is GORGEOUS. Like everybody else, I can't wait to see a picture of you in it. Thanks for the Wurm reminder. I keep thinking I will make that hat and then something else jumps on the needles. Heart Warmer is really pretty (and I love the bobbles). I love your sweater! The colors and the cozy look of this sweater have me hoping to knit something like it for myself! I'm always into socks. Can't stop, as my feet are cold all winter. That sweater is so awesome, Karen! I can hardly wait to see you model it! Your new sweater is amazing!